These are the first fruits from my dehydrator. I purchased some cheap very ripe bananas with spots just appearing on the skins. 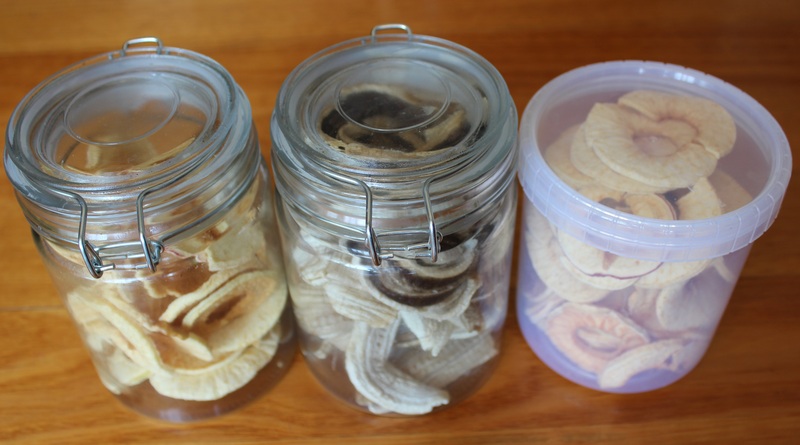 Peeled and cut them down the middle, then dehydrated them at 57 degrees C (135 degrees F) for 8 hours. I am lucky to have a local supplier of apples that have not been waxed and are very fresh so I purchased a bag of Fuji. Using my nifty mechanical peeler, corer and slicer I cut up several apples and dehydrated them at 57 degrees C (135 degrees F) for 9 hours. The results are fantastic. Sweet and flavoursome. Now to experiment with other fruits and vegetables.